I have been wanting to share the clothes I brought on our 2 week Europe trip last year. It was in late May/early June however we had some weird rainy and cool weather so it was more like Spring or Fall weather than summer. Now that Spring weather is about here fingers crossed it seemed like a great time to do this post. If you are taking a trip this Spring or Fall I hope this is helpful for what to clothes to bring for 2 weeks. If it is not going to be quite as cool, you can easily cut down on the outerwear items but with the weather we had I definitely needed them. I will share how I packed my clothes plus other items in my 1 carry-on (the Aeronaut) and handbag in a future post. Even though shoes are not in the pieces count, I kept it to two. If you needed to bring a million different shoes to go with your clothes that defeats the purpose of packing light and having a remixable wardrobe. Just make sure you can walk all day in your shoes without problems. Not once did my feet hurt on this trip because my shoes were comfortable. 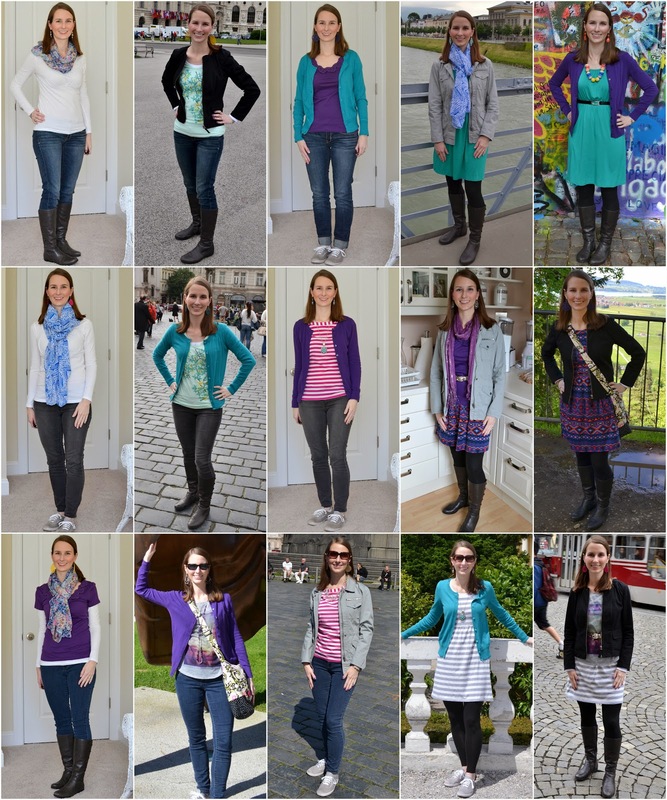 Here are the 15 outfit combinations I wore on our 15 day trip. Some of the pictures I took on our trip and some I recreated later because I didn't have a photo of just me in the outfit or I was wearing my rain jacket over my outfit. Here are 3 bonus outfit combinations that I didn't wear but it was nice to know I could have worn three additional outfits (without any additional pieces) had we gotten delayed or I wanted a outfit change. I suppose I could have also called this 15 Pieces 18 Outfits but that just doesn't have the same ring to it. 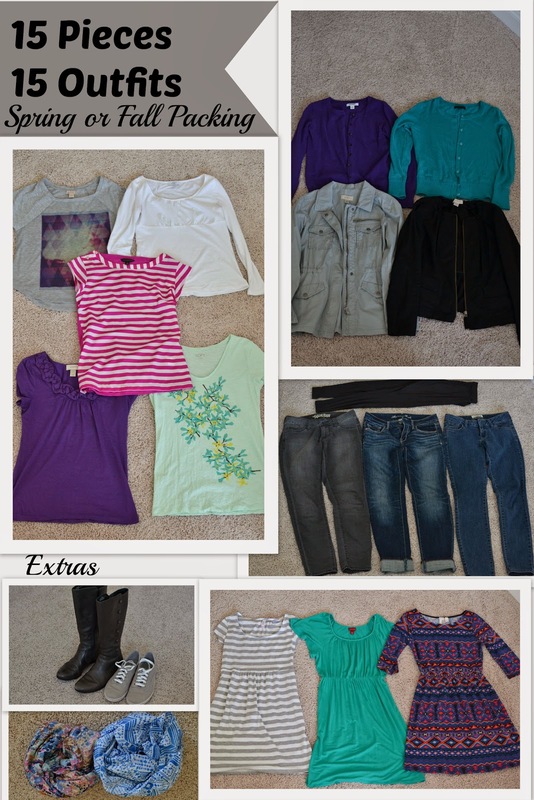 The images above are examples of photos I took of my trip wardrobe remix on my phone before packing. Each day before getting dressed I could look at them to easily choose an outfit instead of spending time trying to remember how I wanted to pair pieces together for 15+ unique looks. 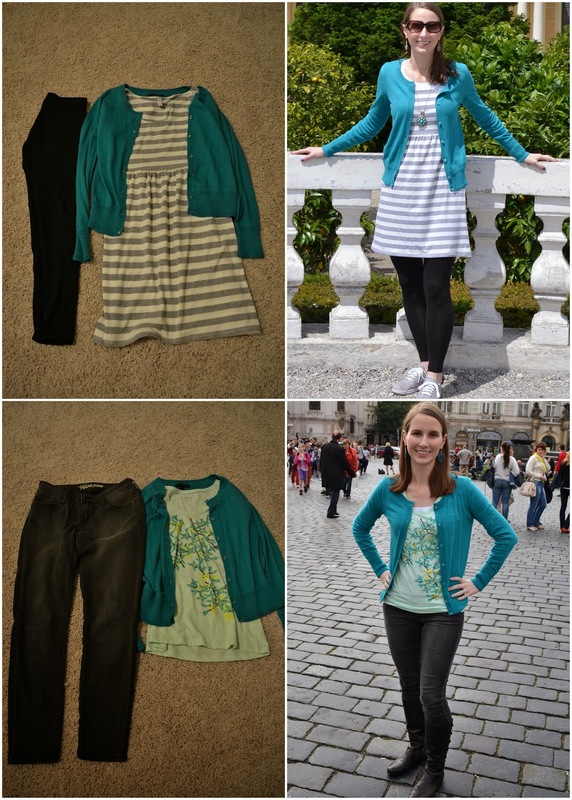 So as you can see below the images on the left-hand side turned into outfits I wore on the right-hand side. Hopefully this is useful for someone else planning a trip! It was actually fun figuring out what combinations and how many combinations I could make and bring the least amount of clothes items. I wish I had done a better job of this when we went to Italy but I will utilize wardrobe remixing again for future trips. Cute! I love how you showed how to mix and match everything. This is awesome! Love how you had so many outfits out of 15 pieces. Genius! Thanks for linking up with us for Pin-Spired!